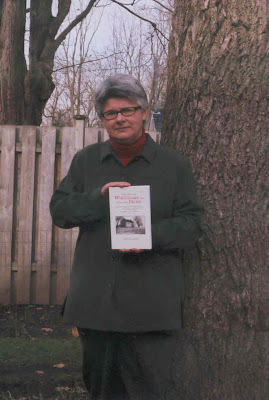 "The main inspiration for the bestselling Jalna novels of Mazo de la Roche was her own family tree," says Napoleon author, Heather Kirk, pictured here beside the black walnut tree in her own back yard. Kirk's recently released scholarly book, "Who Were the Whiteoaks and Where Was Jalna?" (Tecumseh Press), reveals new sources for the origins of the famous fictional Whiteoak family. Heather, who published a nonfiction book for teens about Mazo de la Roche last year, also writes novels for teens. "Warsaw Spring" and its sequel, "A Drop of Rain", were published by Napoleon. On October 16, 2007, Heather talked about her books to an audience of 200 people at the 18th annual Authors' Night of the Gryphon Theatre Guild in Barrie, Ontario.